The smartphone design trend in 2018 seems to follow these simple rules — glass backs, extra-wide 18:9 displays, thin bezels, and a notch on the top of the screen to house the earpiece, selfie camera, and sensors the phone needs. And that notch... well it has been controversial to say the least. Lots of vocal people out there make sure to tell manufacturers that they hate it. So, some Android phone makers, whose latest flagships sport "a notch", have started to add a software feature, which paints the UI at the top of the display in black, simulating a whole bezel. So, you can kind of, sort of, hide said notch. Would you use the overlay to hide your phone's notch? Nah! If you've got it, flaunt it! I'd test it out, but it doesn't bother me that much Absolutely! I might even add black tape up there if it's not convincing enough! Nah! If you've got it, flaunt it! Absolutely! I might even add black tape up there if it's not convincing enough! No body likes this stupid trend. I hope it won't last long and die soon. Thank God all the other OEMs that went with a notch at least have enough space on either side for actual useful information. Apple by far has the least amount of screen realestate compared to every other notch on the market. Apples notch doesn't even have enough space for a battery percentage, let alone any other useful information. Plus apps have to change in order to work with Apples useless notch. Thus the need for Apple to FORCE it's developers to accommodate their iPhone X notch, and the tiny amount of space on either side. Apps on Android don't have to change to accommodate any of the current notches. Plus Android P gives the user the choice to use or not use a notch. This is one thing Apple has failed with. So Android's implementation is better in my opinion, as you still have info on either side of the notch on the Android side of things, so the space is still efficiently used. However, Android's implementation also allows room for the user's preference to play a role, since you can customize it to your taste. This is just an opinion, so relax. Wrong,https://youtu.be/JHeusHzhtHU Vivo V9. PUBG, See it doesn't really use notch, the game doesn't reach to the notch so it doesn't really matter If you hide the notch or not, you won't gain anything, you are just shutting down part of your screen for zero reason. I have lot of apps which are truly fullscreen. Sgodsell try to act like developers doesn't have to update their apps to notch, Yes they do If they want to use the whole screen. I couldn't give two s**ts about PUBG, as mobile gaming, especially complex games such as that, are simply retarded to play on a smartphone. If i want to play proper games, instead of small little simple games, then i'm going to use a proper windows desktop/laptop. Smartphones are good for simple games and nothing more. Furthermore, the game does reach the notch, just watch other videos of PUBG on Android. It goes all the way around the notch, if you want it to. That's the thing about Android, you aren't forced to do something, you can choose to play the game like you want to play it. Choice and customization is what Android has and what IOS lacks. #7 You are still repeating the same garbage all over again. You're a broken record. How is it garbage? When it's the truth. It's not true which this video pretty much proveshttps://youtu.be/JHeusHzhtHU See the PUBG with Vivo doesn't reach edge of the screen because it doesn't support the notch. Developer need to update the game before. We get it from the first time. You don't have to repeat it for a million times. Find a new hobby. I know lots of you Apple zealots will praise Apple, even if Apple made a crap on a stick. Then many of you would praise Apple for making the best crap on a stick. 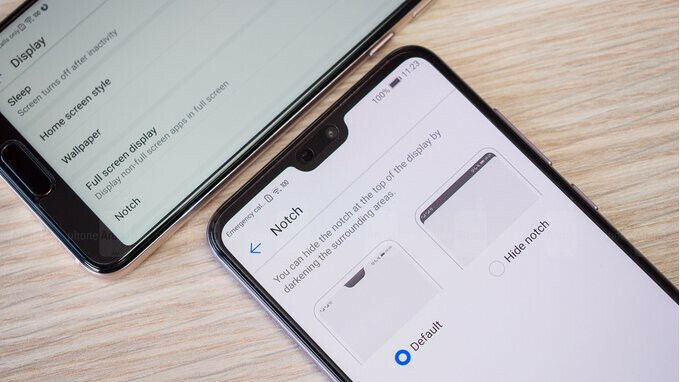 If i have to choose big bezels or notch, i would choose notch everyday, Especially with the X which doesn't have chin. But sure i would like this phone even more without notch, but we have to wait that for 1-2 years. When looking that notch it just reminds how close we are to have true fullscreen phone. If i had to choose between massive bezels and a notch, then i would probably also bite the bullet and force myself to deal wih the notch. However, that isn't really the reality of things. The choice isn't between massive bezels or a notch, the choice is between a notch or a display that isn't interrupted. The reason that the choice isn't between massive bezels and a notch is because smartphones like the Galaxy S8 and S9 has a better screen-to-body ratio than the iPhone X, so you actually get more screen in a smaller body than you do with an iPhone X, and that's without having to deal with the unnatural screen shape that a notch brings. If i had to choose between that, then i would choose the smartphone with an uninterrupted screen shape and the highest screen-to-body ratio. It’s not a trend, it’s a transition. Everyone wants a full body display but nobody wants to lose their front facing camera. It’s a trade-off but I’d rather that than bottom and top bezel. I would happily lose the front facing camera, but i suspect i would be in a very small minority. I don't particularly like a notch as I prefer thinner bezels - that is my own preference and I don't knock anyone who likes or prefers the notch. Its all subjective. I much prefer the Samsung design language IMHO. But to each their own. After Apple did it after Essential, the notch is the feature of the both companies. Others don't need to follow. Name one company who made a notch similar to essential's approach. I'll wait. All other notches give a lot more useful screen space. Apples notch has the least amount of screen on top. So much so, that apps have to change in order to work with Apples notch. As a matter of fact there is so little space with Apples notch, that Apple is FORCING it's developers to accommodate their iPhone X cutout, so apps can work properly. So far this doesn't has not happen with any other smartphone with a notch on the market. Plus Android itself works better with notches to the point that developers don't have to accommodate any notch. It's regular development as usual. https://youtu.be/JHeusHzhtHU I see huge black pars both sides of the screen, how you explain this? That's ok, the X has huge black bars all round the screen permenantly. You mean a company who stole Essential's "screen cutout" idea ? Apple ! A wider notch or a narrower notch does not matter, the screen cutout idea is what matters.